Kristen is frequently quoted as a real estate expert in multiple publications including The New York Times and CBS New York. Kristen Larkin is a native New Yorker who was born and raised in the Windsor Terrace section of Brooklyn where she currently resides. She has been selling and renting New York City real estate since returning to the US in 2007 after several years in Rome, Italy. She brings her international experience, as well as her creative background into her dealings. 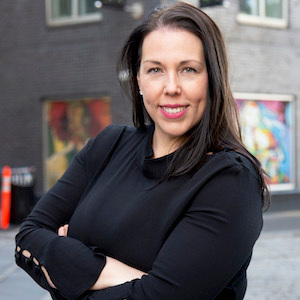 Kristen has acted as Sales Director for condo developments in Williamsburg, and Ocean Hill, Brooklyn. She is an expert in New Development and Brownstone sales, specializing in Brownstone Brooklyn, Downtown Manhattan and first-time homebuyers. Kristen brings a history of record breaking sales and rentals, a positive attitude, and honesty to all of her real estate dealings. She prides herself on taking the time to fully understand, meet and exceed the needs of each and every client. She enjoys sharing her city and everything that New York City has to offer with new arrivals, and educating clients on the constantly changing market to enable them to act accordingly for a successful transaction.